Mohegan Sun, one of New England’s top destinations, has purchased a number of Clay Paky GlowUp portable, battery-powered luminaries. Located in Uncasville, Connecticut, Mohegan Sun offers gaming in three casinos, fine dining, luxury accommodations, retail shopping, live entertainment and sporting events. Attractions include an indoor 55-foot waterfall, electrifying water wall and the world’s largest indoor planetarium dome. Entertainment venues are a 10,000-seat Arena, 350-seat Cabaret Theatre and 300-seat Wolf Den. "We chose Clay Paky GlowUps because we do a lot of events on the fly in various locations," says Brian Horne, lead lighting technician for Sports and Entertainment at Mohegan Sun says: "We were looking for a wireless LED that we could connect to a console. One challenge is that since we’re a casino, WiFi can interfere with some of our equipment. The GlowUps’ frequency-hopping feature from Wireless Solution was able to work within our system." 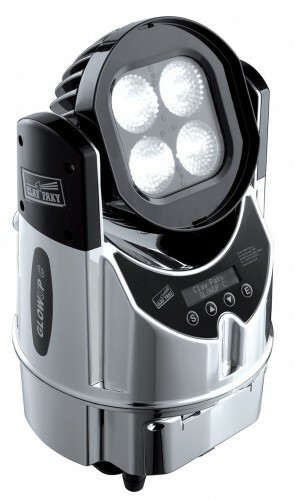 Clay Paky’s GlowUp is a portable solution based on durable, high-power LEDs. Its light source is four 10W LEDs (with options for RGBW, Cool White, Dynamic White) with nominal power of 50W and a total output of 1200 lm. By eliminating the logistical headache of running cables at events, the battery-operated luminaire dramatically reduces set up time, saves money and improves safety. With its rechargeable lithium battery, GlowUp provides years of energy-efficient service. The fixture, which weights just 16.5 lbs., is fully programmable allowing users to select scenes from a library of dozens of suggested colors and a number of pre-programmed, color-changing sequences. "Our first application for the GlowUps was for the conversion of our buffet into a bourbon tasting lounge for our annual Sun Winefest event," says Horne. "There was limited power and we needed something with a small profile to fit into little corners. Since the room was shoulder to shoulder, we were asked not to use cable ramps due to the Fire Marshal’s concerns." Horne notes that the GlowUps have been called into service for "other similar events," typically with "a very short time to load in and out since the lights are very easy to use. You literally power them up, they see the transmitter and set the address. Their easy operation allows us to sneak in accent lighting as needed." In addition, he reports that A.C.T Lighting, Clay Paky’s exclusive distributor in North America, "has been great helping us get the GlowUps up and running." Francesco Romagnoli, Clay Paky area manager for North and Latin America, adds: "We’re excited about our new GlowUps and feel the Mohegan Sun applications are perfect for the fixtures."